Best Dog Training Alexandria VA, Arlington, Falls Church, Annandale, McLean, Fairfax County, Northern Virginia! I have been an animal lover my whole life, and I have had a passion for training animals since I was a young child. I have trained dogs for many years using numerous dog behavior methods. When I heard about Bark Busters and their dog training methods, it was a very easy decision to join the Bark Busters Home Dog Training team. Bark Busters' training techniques work where others have failed. We use a method that is very dog friendly, and teaches an owner to communicate to their dog in a way that dogs communicate with each other. It is based on body language and voice tones. It is a very simple method that is very easy for the dog to understand. We don't rely on treats to get a dog to obey. We also don't do anything that hurts a dog as that would break the trust between a dog and its owner. Instead, we use a method that teaches owners to gain a dog's trust and respect so that a dog CHOOSES to obey. 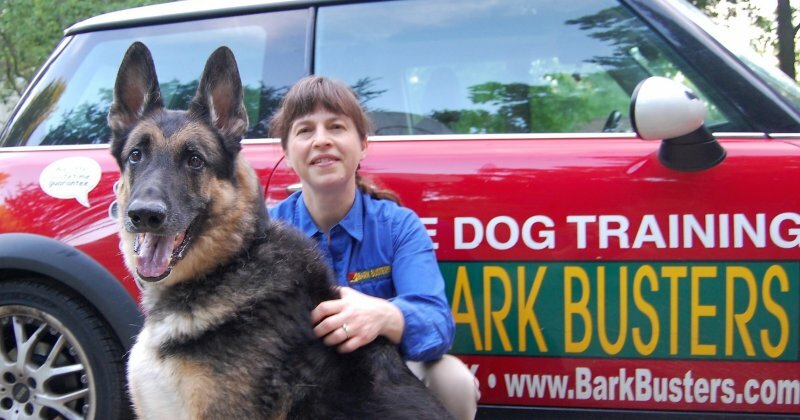 Bark Busters is the world's largest, most respected dog training company in the world. We offer guaranteed lifetime support that follows the dog to any location where there is a Bark Busters office. As a professional dog trainer with Bark Busters Northern Virginia, I love working with the other Bark Busters team of trainers, who collectively have trained over 1 million dogs! Not only do we have a great pool of knowledge to draw from, because we have trained so many dogs, but we also realize that every dog is unique and so we design a dog training program catered to each dog and its unique needs. Bark Busters Home Dog Training can help you with any dog, any age, and any issue. We train your dog in your home where most dog behavioral issues occur. By reinforcing our dog training tips just 15 minutes a day, you will see a HUGE difference in your dog's behavior. One of the things I have learned from being a Bark Buster dog trainer is that dog owners are great people. It is such a joy to work with people who share their life with a dog. I can think of no better job in the world. Please contact me if you have any questions or if you would like to learn more about how I can change your relationship with your dog for the better. Jeanie was terrific. Very knowledgeable and calm and we got right to work. Tess responded almost immediately to the training. She walks perfectly on leash, does not urinate in the house anymore and her anxiety level has dropped tremendously. I would recommend Jeanie to anyone who wants to have a happy dog (and a happy dog owner). Jeanie came to address challenging behaviors; nipping the toddler and aggression towards other dogs when on leash. Her techniques work! No more aggression and walking Yoshi is easy now. Jeanie knows her stuff!